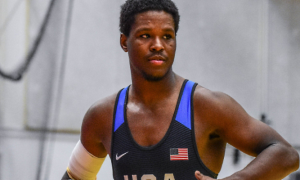 Prior to last week’s Dave Schultz Memorial International in Colorado Springs, Geordan Speiller (Florida Jets) hadn’t been on a competitive mat since early-June, when he stomped through the US University Nationals. If you dial it back further, Speiller’s actual last Senior competition before the Schultz was the Olympic Trials in Iowa City, where he blitzed the field before succumbing to two-time World medalist Andy Bisek (Minnesota Storm) in the best-of-three finals. If you add it all up, we’re talking seven months in between tournaments and just about nine months overall when it comes to Senior matches. That’s quite the respite, especially considering what he pulled off upon his return. So there Speiller was at the Schultz, up a weight and hustling into exchanges while putting his superb athletic talent on display for all to see. 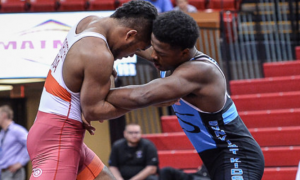 It’s hard to miss — Speiller chains attacks in Greco Roman with a level of speed and fluidity that leaves opponents frustrated and constantly confused. First it was rugged US Greco vet Courtney Myers (Army/WCAP), who fell via technical fall. Then it was Japan’s Shoei Yabiku, a fine wrestler who had a moment or two but ultimately couldn’t keep up with what Speiller was bringing. In the finals, 2016 Olympian Mahmoud Sebie (EGY) stood as the conclusive obstacle in this triumphant comeback. Down 3-0 entering the second period, Speiller dashed, darted, and persevered to come out on top with a criteria win, earning him his first title at the premier winter event on US soil. All geared up and zeroing on the World Team Trials this coming April, Speiller will next be making his way to Cuba for the 2017 Granma Cup. He will also be the only US Greco Roman athlete competing at the tournament. Of course, given the 23-year old’s desire for international competition, that is of little concern to him. With everything is in his career now back on full-throttle, we caught up with Speiller to get his insights on his impressive Schultz performance along with what he’s looking forward to coming up. 5PM: Was there anything about your performance last week that surprised you? Geordan Speiller: That surprised me? No. No, I was ready to go the whole time. I was ready to go. As far as my performance, it wasn’t surprising. 5PM: Outside of your overall objective, I mean, your objective was to win the thing. But did you have any personal goals considering you were coming off an extended break? GS: Well, my personal goal going to this tournament was just to get competition. I was competing above my weight class, so winning wasn’t everything, it was getting the matches in, getting back on the mat, and having to adapt to that environment again. Nothing surprised me. My personal goal at that tournament was just to compete and see where I was as far as a platform of excellence standard. GS: He was bad, he was bad. 5PM: Yeah, it was obvious right from the start. It’s how he was operating. You’ve been in bigger matches before, but that second period was memorable. Did you know you had the reserves necessary to come back? GS: Yes. What I have been working in practice is patience and not hesitating, and knowing the difference between those two. In the first period, I was very patient, I wanted to see and analyze this guy’s methods and tactics. When it came to the second period, I saved enough fuel because of my methods and tactics of observing and analyzing. Coming into the second period, you know, I just turned on that switch and it was time to battle. I was ready to go. I was conserving myself for when I needed it and I think I played the part pretty smartly. 5PM: I’d say so. Look, you said earlier that you weren’t surprised but at the same time your goal was to get matches in. But the fact that you did win the tournament, did it feel like something different to you? Or after the adrenaline wore off did it feel more like business as usual leading up to April? Geordan Speiller: I have to admit that overall, if I reflect back on the tournament and then reflect on the time that I had off, I see that, you know, it is surprising for me that I won the tournament. Taking it from the top, I had never won the Dave Schultz, I had never won this in three or four years. It was a sense of closure that I got, getting a Dave Schultz title. During the match when it was happening, winning that match wasn’t a surprise because once you go out there, it’s just business and everything else just goes away. But yeah, once the adrenaline wears off and I get the chance to reflect and see where I started in the beginning of my training to where I am now and winning that tournament, it caught me off guard a little bit. I didn’t think I was actually going to win it. If you would have asked me three months ago if I thought I was going to win the Dave Schultz, I would have said, Well, I hope I do, but I haven’t competed in a while, so I’m just getting in some matches. If I win, great. If I don’t it’s not a big deal, I still accomplished my goal. I mean, I wasn’t even going to go to the Dave Schultz because I was pretty heavy, even for 80 kilos, and I had some other supporters telling me they already booked a flight and it was non-refundable, so I felt obligated to go and I’m really glad I did. They persuaded me into going. 5PM: How long into the tournament did it take for you to feel “back”, like you were “at home”, so to speak? How long did it take to get your sea legs under you? GS: It’s funny you put those words all together. When I was wrestling against Japan, right before the match my coach came over to tell me, “Remember Geordan, this is where you are most comfortable, here on the wrestling mat.” Right there, it was a sense of comfort, a sense of a comfortable environment where I felt like I was back at home. Those words that my coach gave me, right there and then I knew “I’m back” into competition, I’m ready to go. Right in that second match with Japan. 5PM: The Schultz tournament was your first event without forced par terre as part of the curriculum. We reported that it is coming back, but it hasn’t yet obviously. Just curious, how did you like wrestling without forced par terre in there? GS: You know, I was preparing myself for forced par terre. I was training for par terre like crazy when I was over in Canada, I flew straight from Canada to the Dave Schultz tournament. I watched a couple of matches and was wondering when they were going to call forced par terre. I was looking around and then I finally found out they weren’t doing forced par terre (laughs). And right there, I had a glow. I smiled. I was like, Oh God, maybe I can win this now. I’m just really glad that tournament didn’t have it. I don’t want to say it’s my kryptonite because I’ve thrown some people on their heads from top. But for me, I feel like as a man, I’m not just going to go down without someone taking me down. For me, I can’t fathom it sometimes, forced par terre. It’s an advantage somebody has over you. What if we started with one guy behind another guy standing up? It is definitely a handicap to be on bottom. So I’m really glad they didn’t have it at the Schultz. I really hope they keep forced par terre out, but most likely they are bringing it back in, though I’m training for that, too, and we’ll have some fun with that. 5PM: In the time you’ve been away, a couple of young guys have emerged at your weight, Kamal Bey and Jesse Porter. When you look at these guys, what is it that you see? Geordan Speiller: I see the Greco program, at least at 75 kilos, developing a little bit. But if you’re mentioning if they can compete against me and give me a good competition, I just think I’m more experienced and I see the upcoming stars, I guess you want to say, they are just a little bit overrated because they don’t have the accolades or credentials to even be in the realm of my level, which is world-level. I’ve beaten a World Champion, I’ve went against Olympians, I wrestled at the World Cup in Iran. I’ve just been all around the world competing and these guys are just starting. I’m glad that they are starting because it makes for good future training partners but again, I think that right now, they need to get better competition overseas and wrestling Americans is not going to cut it if you want to compete with me. 5PM: As far as competitors go, you’re the only US guy going to Cuba for the Granma Cup. Does that make any difference to you at all? GS: No difference. Nothing at all. It doesn’t make a difference to me. I’ve done it plenty of times, I’ve competed plenty of times by myself and I prefer it that way. Sometimes, other guys on the team, their goals are different than my goals. Their personalities are different than my personality. Sometimes if I have a roommate, they snore or keep me up at night, whatever (laughs). It’s a lot better to do it as an individual. It’s very important to have a stress-free environment because you already have a lot of pressure on you to perform and whatever you do, anything you do before competition, significant or insignificant, could matter. Your attitude matters before a competition and you don’t want any distractions. 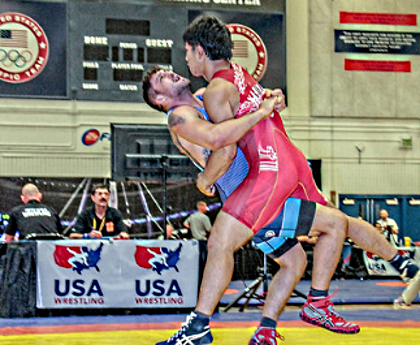 5PM: Without giving anything away, what is your training going to look like as the World Team Trials approaches? GS: Well, I have a lot of options, though I haven’t set forth on any of them permanently, as in dedicating myself to any of the training programs that are on my schedule. I have a lot of different options. I can bring guys in. I have a friend from Serbia, many friends from Hungary. I have friends from Japan, even. I gave them all a call and they said they could come here or I could go there. We’re trying to find the right place, the right time, and see everyone’s availability and coordinate with that however possible and compensate each other on what we’re going to do. It’s not just me, those are my friends. So whatever they need from me I’m going to try to provide, but it’s vice-versa, too. Me, my coach, and some of my other supporters are discussing what we’re going to do in the near future. But as far my training goes, it is up to par and I’ll definitely be training hard. 5PM: You bring a very exciting style to Greco Roman wrestling. It’s something the sport needs more of any way it can get it. I’m not asking if you try to be exciting on purpose necessarily, but are you cognizant of this? Do you sense how the sport needs more excitement right now? Geordan Speiller: Oh, most definitely and I’m very aware of that, as well. I always like to say about Greco that it’s, Throw or be thrown. There should always be an attempt in every match for a bodylock throw and I think there should always be excessive hand-fighting, guys going after each other, and trying to score as many points as possible. Yeah, the goal is to win, but how are you going to win? Well, you have to score points. You can’t be content with scoring one point and doing nothing after that. I think a lot of the Greco wrestlers in the United States and even around the world, especially when par terre is in place, it’s relaxed and there is not a lot of engagement. They wrestle with a little bit too much strategy. I think it’s better to let loose and see who can score more points. I think as far as all the Greco wrestlers out there, just go out there and wrestle. Don’t worry about winning or losing because someone is going to win and someone is going to lose — that’s for sure. If you don’t worry about that, your performance is going to go sky-high and you’re going to score some points. Follow Geordan Speiller on Twitter to keep up-to-date on his training and competitive schedule.